This past month we’ve discussed all manner of elements in the night sky. However, we’ve yet to touch on the objects that compose most of these delights, stars. Spinning balls of gas and light form the many globular clusters, open clusters, constellations, asterisms, and galaxies of our universe. With this in mind, let’s take a closer look at their composition, their color, their life and what makes them glow. I’ve also got a couple of pieces of eye candy for you to gaze upon in the coming week. With the information you learn here, your knowledge of the celestial heavens will continue to grow. You may have heard that we circle an average star. This is quite true, though our sun is no less brilliant. Our star is a yellow dwarf a little less than 93 million miles from Earth, a distance also known as one astronomical unit.2 It glows a yellow-orange color estimated to be 4.5 billion years old. The light we receive from it takes eight light-minutes to reach us. Because of our place in the solar system coupled with the size of our planet, and our distance from the sun, Earth sustains life. Our sun is known as a main sequence star, and as such it generates its energy through the conversion of hydrogen to helium. This is the same process we discussed in our first article with regards to how stars form. The high temperatures combined with the force of condensing and collapsing of gasses yields nuclear fusion. A yellow dwarf will live approximately 10 billion years before slowly dying as it uses up all of its gas. Accordingly, this puts our sun around middle age. Using this data and specialized equipment we can determine the types of stars in the night sky. You can do this yourself without fancy machinery. Many stars shine a particular color and can appear larger or smaller than others to the naked eye. For example, the star Antares, in the constellation Scorpius, is a red supergiant hundreds of times larger than our sun. When observed unaided, it appears brighter than the surrounding stars and is very clearly red in color. Though it may seem counterintuitive, the redder the star the colder it is and the older it is. Newer stars are bright blue to white and burn hot. Of the many stars in Scorpius the majority are in the blue to yellow color range. Scorpius is also unique in that it is available for viewing in both Northern and Southern hemispheres. The brighter and/or more distinguishable stars in our sky have yielded the creation of constellations and asterisms. 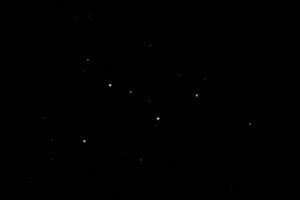 In our northern sky the constellation Cassiopeia3, a queen of Greek mythology, is both a constellation and an asterism. Cassiopeia marks the change in seasons and is known by an alternate name, the summer W. The stars align in the shape of a ‘W’, composed of five stars. These stars are named using the Greek alphabet. Epslion is a main sequence blue star. Delta is actually two blue subgiant binary stars, Gamma is a blue super giant. Alpha is an orange giant, and Beta is a white giant. To the naked eye, it might take some time to focus and be able to discern one star’s color from another. Astronomy requires some patience, but sometimes your best nights of star gazing are just focusing on one object in the sky while lying on a blanket on a grassy hill taking in the awe of the cosmos. Crux4 in the southern hemisphere is similar to Cassiopia in that it is also known as both a constellation and an asterism. Crux is also called the ‘southern cross,’ or ‘southern kite.’ The shape is composed of four main stars which can be visually connected in the shape of an ‘X’, or, from point to point, the form of a diamond. Beta Crucis is like Cassiopeia in that it too is a binary star formed of two blue giants. Unlike Cassiopeia, it has a second binary main star set. Alpha Crucis is a binary of two large blue main sequence stars. 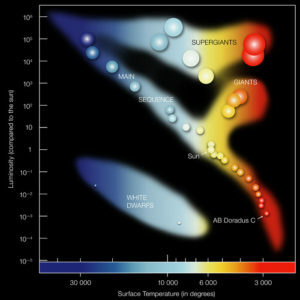 The remaining two stars, Gamma Crucis and Delta Crucis, are evolving red giants. When you are out at night glancing up at those pinpricks against the black sky, think about the shapes they create, and the objects that create those shapes. Our galaxy is besieged with stellar orbs of immense mass and volume spinning at great speeds and burning at unimaginable temperatures, shining their light on us from unfathomable distances. Join us next week when we report from the famous McDonald Observatory in West Texas. We’ll be talking a little about astronomical equipment and that great trail of stars in the sky; our very own Milky Way.